Home»PLASTICWARE»White Plastic Plates»7oz. Translucent Plastic Cups 100ct. 7oz. Translucent Plastic Cups 100ct. 10" White Plastic Plates 50ct. 9" White Plastic Plates 100ct. 7" White Plastic Plates 100ct. 12oz. White Plastic Bowls 100ct. 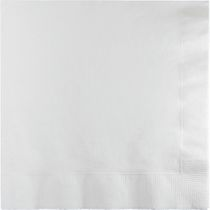 White 2-Ply Paper Lunch Napkins 50ct.